هانفو (بالصينية: 漢服 ، 汉服 ، hànfú ؛ مين جنوبية: ‎hànho̍k‏ أو hanhok؛ كانتونية: ‎hɔn˧fʊk˨‏ أو honfuk) ، هو اللباس التقليدي لقومية الهان في الصين، حيث برز هذا اللباس خلال جزء كبير من تاريخ الصين ، وخاصة خلال حكم اسرة تشينغ. ^ A State of Warring Styles نسخة محفوظة 12 يونيو 2018 على موقع واي باك مشين. ^ Stevens، Rebecca (1996). The kimono inspiration: art and art-to-wear in America. Pomegranate. صفحات 131–142. ISBN 0-87654-598-3. ^ Shaorong Yang (2004). Traditional Chinese Clothing Costumes, Adornments & Culture (باللغة الإنجليزية). Long River Press. صفحة 7. ISBN 978-1-59265-019-4. Men's clothing in the Qing Dyansty consisted for the most part of long silk growns and the so-called "Mandarin" jacket, which perhaps achieved their greatest popularity during the latter Kangxi Period to the Yongzheng Period. 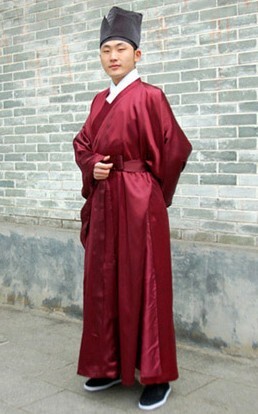 For women's clothing, Manchu and Han systems of clothing coexisted. آخر تعديل لهذه الصفحة كان يوم 12 فبراير 2019، الساعة 21:32.